Me and my running adventures. Adventures that mostly consist of me going out and actually running. 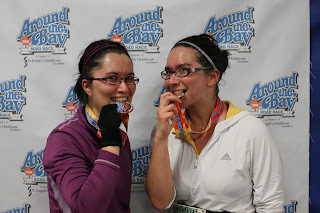 So, my first Around the Bay! My parents and I arrived on the Saturday, went to the expo and found my sister there. We looked around a bit then went to scope out "the Hill". My sister said it didn't look "too bad" which, when you haven't really done anything all day except walk partway down, and then back up that hill, it doesn't seem "too bad". I suspect she re-evaluated that assessment during the race. We then headed back to the hotel. Around 5 pm we went and had dinner at the restaurant at the hotel (baci ristorante - Good food! Would recommend), went back upstairs and eventually went to bed. Didn't say this first day was interesting! But, I suppose the day before a race should be boring. The most interesting thing was all the things my sister didn't bring that I provided her with - oatmeal for breakfast, a toothbrush, face wash, beer (okay she asked me to bring it for her), sunscreen and a protein shake. Anyway, come race day I was questioning why we were even running the race (apparently, my sister had been asking the same question the last few weeks), but got my stuff together and we headed out to Copps. My game plan was to run between 2:40 and 2:45 for the race, which I felt was do-able. I thought the conditions were pretty good - a little breezy, but overall nice! My sister and I started out together, which was nice - we were a bit faster than what I wanted but we settled into a pretty good pace. Soon after the start I nearly ran into a pylon on the inside corner, which was a bit scary - wouldn't want to go down so soon after starting. Because it was so crowded, I did see one person run into one of the pylons in the middle of the road. I get that the race organizers want us on one side of the road but in the first few 5km it just was not feasible - it was way too crowded. The first bit of the race went well - the lift bridge was a little uncomfortable on the feet - I felt for anyone in racing flats or minimal shoes (or barefoot! ), and I'm pretty sure there is a couple of wee hills at the beginning I wasn't told about. I wasn't quite prepared for the waterstop situation, which was my own fault, so my fueling was a bit off during the race. Still, I don't like it - the spacing is all over the place, and most, if not all of the stops seemed to only give water on one side. I would have loved it more if the stops were a bit more evenly spaced and had a few more volunteers at each stop. Perhaps it was my pacing, but it was always quite crowded at the stops, and one or two more people would have helped. Still, the volunteers very good about telling you what they had, and tried really hard to make sure everyone that wanted something got it. One of the things that surprised me was the number of (male) runners that had to pee on the course. Admittedly they were far more visible than any females (who I suspect hit the port-a-pottys), since they tended to go...wherever they felt like it. I don't recall seeing so many people urinating during race before. I don't remember much of the race before the hills - I think I was pretty lucky that the weather was good, because there seemed to be a lot of people out to watch the race (I'm pretty sure I gave out some high-fives near the beginning when I felt pretty good) - definitely helpful! 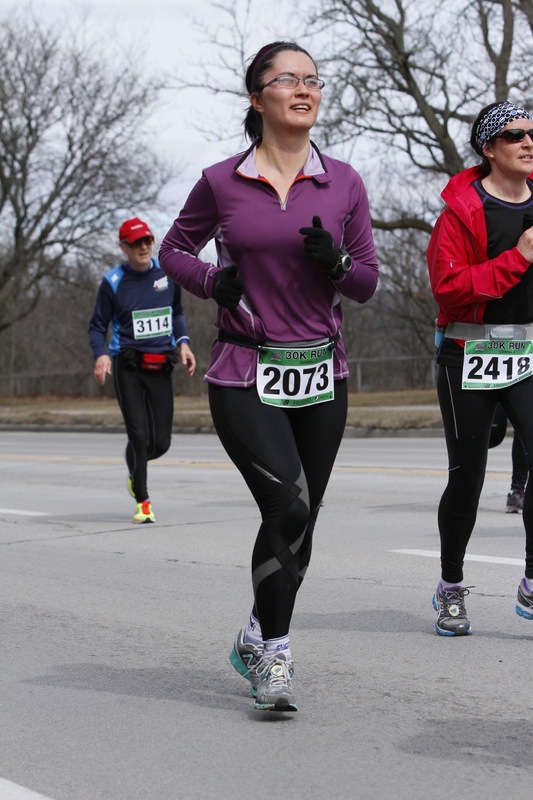 Particularly when we got passed about 21 km or so, since a half marathon was my longest race prior to this one. 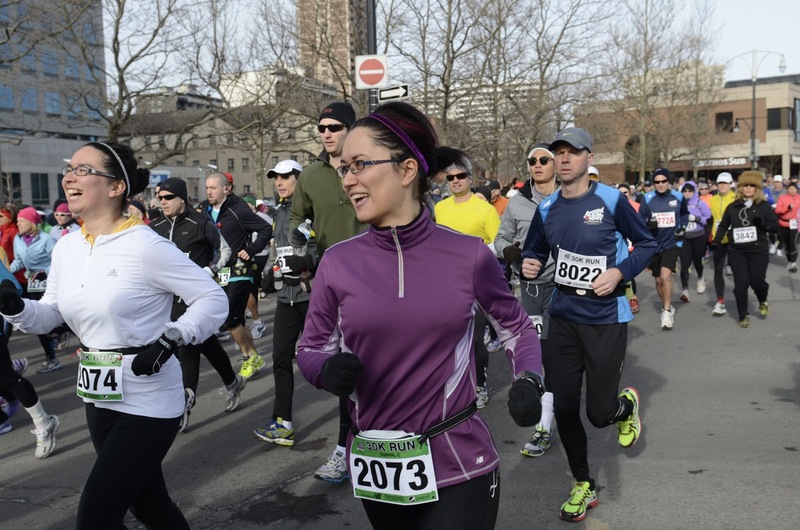 After about 20 km I started hearing "Keep going you're almost there" periodically which, I mean, technically yeah, I'm closer to the end than the beginning, but my idea of "almost" is clearly different than those spectators' idea. If the first part of the race felt like it went by quickly, the last 10 or so kilometres felt like the longest, thanks to the hills. I think I spent a lot of time wondering who designed the course like that! It was also around this point where I could tell that my digestive system was going to pitch a fit, and wasn't best pleased to have anything put in it. Somewhere around 24 km or so, my sister and I split up one moment she was near me, and the next I looked over to see her, and she was gone. I was kind of relieved when we reached The Hill, though I miscounted the number of curves in it, and how many I had done, so when I thought I was near the top, there was actually more hill. I swore (rather loudly) and then saw Sherry (Hi, Sherry! ), which may have been more embarrassing if I wasn't so ready for that hill to be over. I was just happy I didn't have to walk it. And I'm pretty sure I saw somewhere that swearing can help with pain tolerance, and as we know, anything we see on the internet must be true. It certainly made me feel better. I'm pretty sure there weren't any children around. I felt kind of winded when I reached the top, so I slowed a little until I caught my breath, and soldiered on. 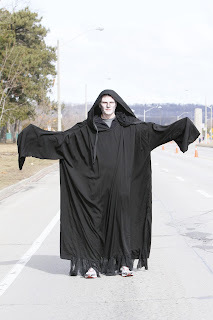 Grim Reaper: Ahh! My next customer! Although I think it was technically still uphill, the way to, and beyond the Grim Reaper felt flat. I think it was around the last km when I was running into a bit of a headwind, though I think it was downhill at that point. I wasn't thrilled about either. There was a guy, I think named Steve, who had some guy trying to encourage him, and get him to sprint, so of course I said "This is my sprint", and some woman near me said "It's always easier on that side of things" - which...true. I did pick it up a bit in that last kilometre - it was cool to see all the people, but sprint would be stretching it. I wasn't too impressed with how long I could see Copps (and not seem to be getting any closer), then having to round the corner before entering it and getting to the finish line. Down the ramp, into the building - I tried to jump over the finish line, but I don't think I jumped very high, and all my photos look like I'm falling over at the line. I walked a little and then waited for my sister who was only about 30 seconds behind me! We went and got food and our medals, and got our pictures taken since there wasn't really a line. At this point, I could feel my calves starting to get unhappy and about to show their displeasure by cramping, so we kept moving, albeit slowly. Up the escalator (which I made my sister walk up a bit, which I don't think she liked), up the stairs, and met with my mom to get our bags, so we could get changed. The bathrooms were surprisingly not too busy, which was really nice. Tried to clean up a bit with a damp wash cloth and did my business, got changed. Met up with my mom and now my dad was finished! This race was also the Ontario Master's 30km championships, so I stopped off at the table (which took a while to find - it was not set up initially, but it was there after a second bathroom break), and ended up winning my age group (30-34). I later learned that I was apparently the only person in my age group. 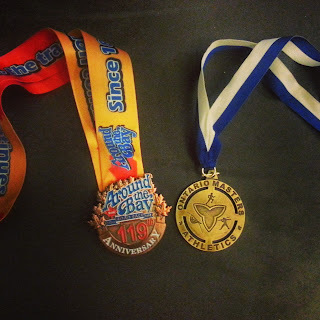 I am fairly certain that I will be bumped to second, as I'm fairly sure there is one woman in my age group that finished much further ahead me that is registered as a master. Still, extra bling!